New Year’s Resolution- More Doggy Daycare! We know that traffic can be rough, so we’re here to make your work day a little more easy! As a “thank you” to our dedicated customers, we will be running a special Daycare promotion during the #SeattleSqueeze. For every five days that your dog attends weekday daycare during the #SeattleSqueeze, we will give them a free full day of daycare! Don’t let your pup get lazy or shy during this time! Bring them into daycare for that much needed socialization and wiggle-removal! What time period is the promotion valid for? Customers will begin accruing ‘days attended’ as of Monday, January 14th 2019 and the last valid day will be Thursday, February 28th, 2019. What if I bring my dog in for daycare on a Saturday? The promotion in only valid on weekdays (Monday – Friday) during the time listed above. Any daycare attendance on Saturday will not be counted towards the promotion. What if I bring in multiple dogs will they accrue days together or separately? Will will count your dogs separately for ‘days attended’, but their bonuses will accrue together (which works in your favor). Example: Bob and Eve come in together on Monday, but only Bob attends Wednesday and only Eve attends Thursday & Friday. Bob came in twice, Eve three times, for a total of five times- their owners would be credited with one free day of daycare, to be used on whichever dog they wish. My dog has a boarding stay during that time, will they also get free days? This special promotion will affect only dogs who are coming in for daycare, not for dogs with an overnight reservation. If I bring my dog in Monday through Friday, will they have a free day the following Monday? We will track the days attended for the entire period, then assign free days after the promotion ends. Free days will be applied to a dog’s account on 3/4/19. If you have any further questions, please contact us directly via our contact page or by phone. If you haven’t already heard, there are mighty changes coming to the way that we commute to work in Seattle. Starting on January 4th, all exits off of the Alaskan Way Viaduct in downtown will be closed. Later, on January 11th, 2019 the Highway-99 Viaduct that connects West Seattle to Downtown and Aurora Blvd will be closed permanently. The tunnel that was built by Big Bertha to replace the Viaduct will not be open until the middle to end of February. This means that for between 3-5 weeks at the start of next year there will be no downtown access from the 2nd largest road serving Seattle proper. Even if you do not commute via the Viaduct or SR-99, the additional traffic created by those re-routed cars will affect your commute greatly. As of now, the City is estimating that traffic congestion will increase at least 30%, with commute times estimated to double during that period. Now is the time to be planning for these changes, and how they may affect not only your commute, but the commute of your favorite furry companion! We understand that this will be a trying time as we all adjust our schedules to compensate for the new changes. Because so many people will be commuting to work earlier in an effort to avoid the worst of the traffic, we will be extending our hours for your convenience. Starting on January 7th, and going until the SR-99 re-opens, we will be open at 5:30 AM and we will close at 7:00 PM, Monday thru Friday. We hope that this change will help your morning commute and allow you to bring your pup to us even during the #SeattleSqueeze. For more detailed information and a news feed of all City-related news associated with the #SeattleSqueeze the best place to visit is the city’s own traffic portal. If using an app is easier than checking a webpage, there is WAZE for both Android and iPhone, which has real-time traffic updates. Do you work downtown? Want to have a FREE consultation on the best way to commute to your workplace? Please contact Commute Seattle! Their representatives can assist you in finding the best ways to make it to work with minimal hassle. They are trained to give info on every commute– via car, transit, bike, or a mixture of those options. As our West Seattle customers are likely to face the most impact from this situation, we here at Seattle Canine Club have put together some additional information in order to aid you during this time. If you live in West Seattle and would like to use a bus to drop off your dog with us, there are a couple of different routes that serve our area of SoDo. Starting on December 17th the City has said that West Seattle residents can use an app called Ride2 (for Android and iPhone) or a phone call to hail a shuttle that will take them from their home to either the Water Taxi dock or the Alaskan Way Junction. During the closure and through March 2019, the Seattle Water Taxi will double its service. To help commuters connect to the taxi, Metro has already announced an additional 250 parking spaces at Pier 2 as well as a shuttle to get people from the Pier to the Water Taxis at Seacrest Park. No matter how you choose to commute during this time, we hope this information was helpful as we all cope with the city’s growing pains. Thank you for choosing Seattle Canine Club! 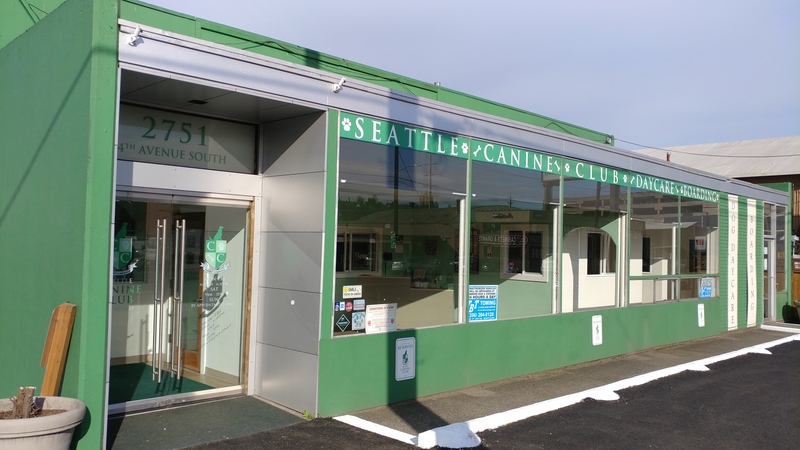 In case you missed the news, Seattle Canine Club now has Online Customer Accounts. Customers can use these accounts to track your dog’s immunizations, your current daycare day totals and your transaction history. While the majority of the transition to the new, digital system has been smooth, there has been a couple of bumps along the way. Thank you so much for your patience with us as we learn to integrate this new software into our daily routine. Today we would like to help our customers solve a couple of the more common issues that may be preventing you from getting your account as up to date as possible. 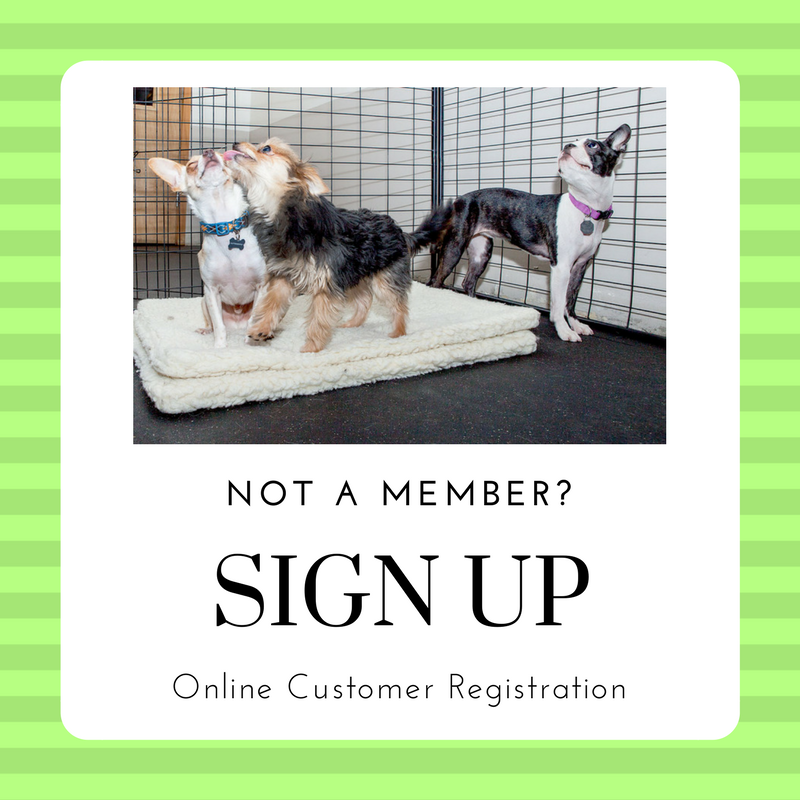 Every dog that is registered with Seattle Canine Club already has an account with us. If you have not already claimed your account, click HERE, and use the “forgot password” button if you know the email address you gave us on registering. If you are unsure of the email address used, please reach out to our staff (info@seattlecanineclub.com) and we will assist you in securing your account. All accounts created for our customers by SCC should already have a Meet & Greet appointment recorded. If a customer created the account, then a M&G will need to be marked as complete by SCC staff. If you and your dog have already done this, please book a Meet & Greet appointment for the day you would like to come in for daycare. We will mark the M&G complete when you arrive, and then update our system at that time. While we have physical copies of owner agreements for all current dogs, we are asking our customers to please re-sign the agreements digitally in order to have them associated with the online account. You can find these agreements on the main account page by going to the top menu, selecting the “My Account” drop-down, and clicking on “Agreements.” On the left side of the screen there should be an option to “view” and “sign” the agreements. Please familiarize yourself with the documents and digitally sign them. During the digitization process we transferred as much previous data as we could from our old pen and paper system. Unfortunately, vaccination/immunization data was not one of the items that was able to be automated in adopting the online accounts. We have been working on updating these records behind the scenes, but because of the sheer volume of data, we could use your help. If you have access to your dog’s latest immunization records you can upload them directly to your account. File types supported are common image files (eg: .JPG, .GIF, .PNG) as well as .PDF documents. After being uploaded, the files will be reviewed manually by SCC staff and your account updated. If you do not have access to your dog’s current immunization records, simply call over to your vet’s office and ask them to send the documents to us at (info@seattlecanineclub.com). 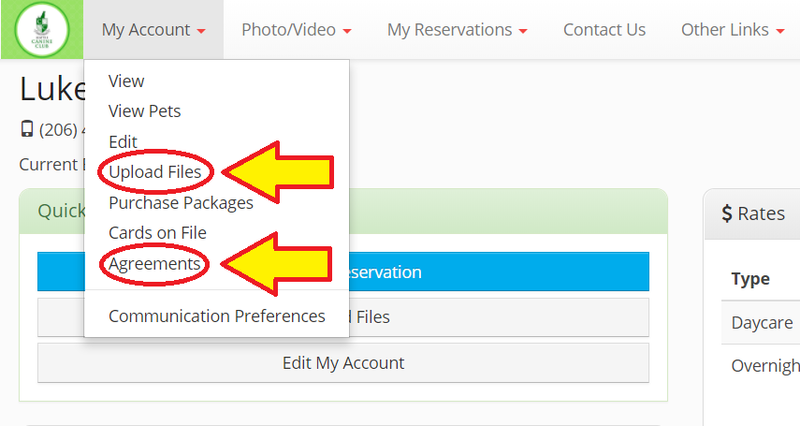 Once they email us the records we will be able to manually update your account for you. We are so appreciative of your support while we upgrade! Let our staff know if there is anything we can do to make your experience with us (on- or off- line) more agreeable. Here at Seattle Canine Club we are dedicated to ensuring the highest level of customer care. It is because of this dedication to good service that we have entered into a partnership with Amazon to offer an online retail store. We control the item selection in the store, while the inventory and fulfilment is completed by Amazon. Our standards for canine food, treats and toys are much higher than the average dog store and we will continue to bring those high standards to our online retail partnership. We hope that this service will be a useful convenience to our members. If you have any comments or concerns we would appreciate hearing your feedback directly.